You may love watching neighborhood kids dressed up as their favorite characters, but your dog may not. Seeing all those trick-or-treaters could stress your dog out. Not to mention, Halloween is full of candy that’s definitely not part of your pet’s diet. Before the ghosts and ghouls of All Hallow’s Eve begin their haunt, take some time to come up with dog-friendly ideas to keep your pet happy. Be sure to keep you dog in a safe area or room of your home away from the front door so there isn’t a chance he accidentally gets out when the front door is opened. Not only does this protect your pet, it also makes kids who aren’t used to dogs feel more comfortable. As always, make sure that your pets are wearing collars with current identification information. Your dog has probably heard plenty of doorbells and knocks throughout his life, but likely not in the huge batch that occurs on Halloween. Training your dog to become familiar with the increase of sounds can be helpful. Consider ringing your own doorbell or knocking the door when you get back every day. You can also have your roommate, spouse or kids do the same. By the time Halloween arrives, your dog will, hopefully, be accustomed to the increased noise level. If you need to take your dog for a walk or to bring him outside, keep him on a short leash and be sure he is wearing visible and up-to-date ID tags. Halloween brings tons of strangers outside who could frighten your pet. 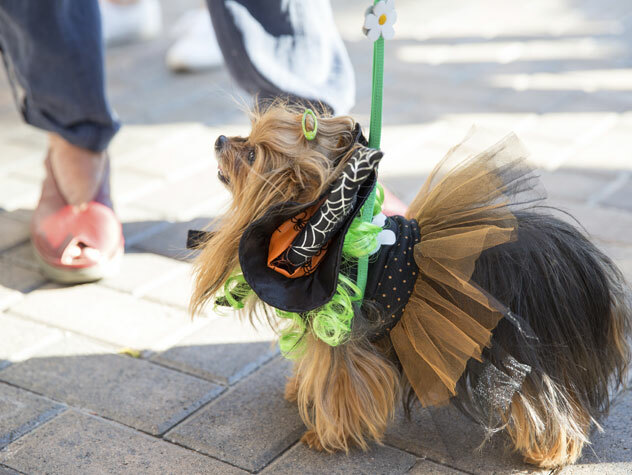 Even if your dog is normally behaved around strangers, the unusual costumes and elevated noise levels could cause stress for your pet. Watch your pet carefully to be sure he’s acting normal. You know your dog better than anyone else, so you’ll be able to see when something’s wrong. You may know that a candy bar will make your pet sick, but he doesn’t. Keep a close eye on your dog to make sure he’s not eating something he shouldn’t. If you see him nibbling, try to get the food out of his mouth. You should contact your veterinarian right away if you have any health concerns. In your own home, keep the candy bowl high up and out of your dog’s reach. Be sure to throw away wrappers so your pet won’t be tempted by the lingering scent of treats. Your dog likely already has a favorite spot in your home. When Halloween comes around, you may want to instruct your dog to spend his time there. The spot is comfortable, so it could help your pet stay calm. You can also give him a treat or favorite chew toy, as chewing helps dogs relieve stress. Plus, chewing on an appropriate toy will keep him preoccupied while trick-or-treaters occupy your welcome mat.